Skinnfiskur has in later years become an established and valued supplier of the highest quality fish derived raw materials for the pet food industry. 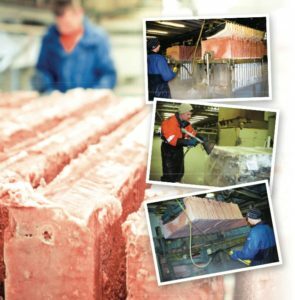 We furthermore offer consistent volumes of fish skin for gelatin production and work closely with our customers to meet any specific demands they may have. At Skinnfiskur we are conscious of the importance of respecting and preserving the environment and have from the beginning put issues of sustainability at the core of our business. Our raw material comes from the Icelandic waters, which are strictly monitored by the local government to secure the sustainable utilization of ocean’s natural resources and good treatment of the marine ecosystem. Recognizing the important requirements of our valued customers we have furthermore implemented a system of traceability in our production as this is becoming an increasingly important aspect of food safety management thus offering full traceability from catch, through processing, export and delivery on the market as required. We enjoy close partnership with our long term suppliers and ensure quality raw materials in line with seasonal availability of products from the pristine waters around Iceland. Skinnfiskur specializes in minced fish, e.g. skins, frames, heads and viscera for the fur and pet food industries. Our fresh high quality raw materials are mainly derived from white fish such as cod, haddock, red fish, flat fish and cat fish along with the much sought after salmon and arctic char. Skinnfiskur also offers consistent volumes of fish skin for gelatin production. Due to the strategically located factory our collecting trucks bring in freshest possible raw materials from surrounding fish processing factories several times throughout the day. Skinnfiskur is owned by Leifur Einar Arason, Financial Manager (CFO), Guðlaug Birna Aradóttir, Managing Director (CEO) and Ragna María Aradóttir (Chairman of board). Skinnfiskur Ltd. has been granted “The strongest in Iceland 2014-2018” award by Creditinfo, recognizing our contribution to the future of the Icelandic economy.